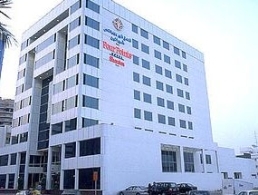 The Four Points by Sheraton Bur Dubai is located in the heart of Bur Dubai on "Bank Street". It is a ten-minute drive from the Dubai International Airport, Dubai World Trade Center and Jumeirah Beach Park. The hotel is within walking distance to the city's most popular tourist attractions like Dubai Museum, Meena Bazaar (Gold souk and Textile souks) as well as the old Bastakiya Quarters. Khalid Bin Al Walid metro station is also five minutes away from the hotel.